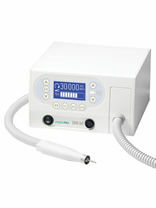 Modern 21st Century designed dust extracting nail drill, ideal for surgery use. Features the latest "quick_grip" centrifugal chuck mechanism, for easy bur changes.This unit has a large dust bag, and 500watt suction turbine. The EVO30 is the base model of a range of three designed for DLT by one of Germanys leading drill manufacturers. If you require more features take a look at our EVO40.